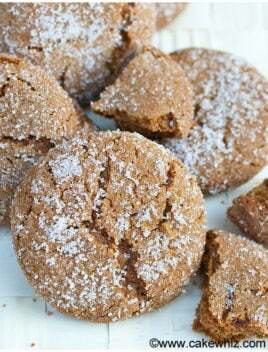 Old fashioned, quick and easy molasses cookies recipe, requiring simple ingredients. This classic Christmas cookie has a soft and chewy texture. 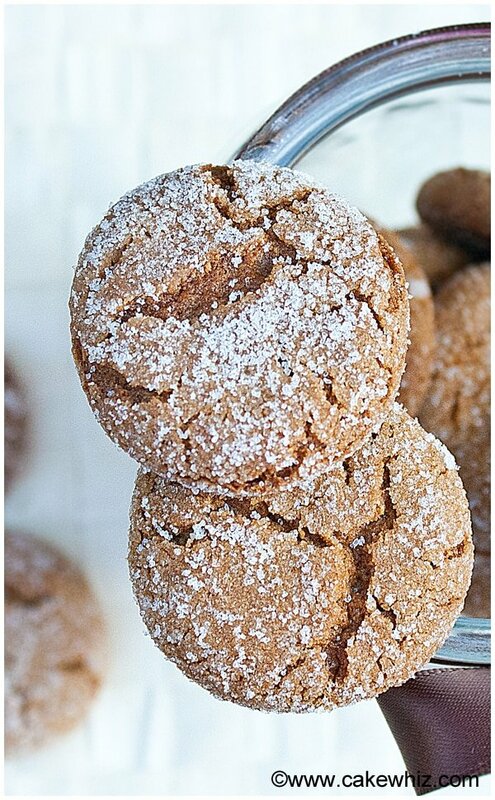 Christmas just won’t be complete without a batch of these molasses cookies. This recipe has been in the family for generations and it’s just as popular as our ginger cookies and cinnamon cookies. These old fashioned molasses cookies are loaded with spices! Both, shortening and butter, need to be used in this recipe for the perfect texture. Chill the dough so that it’s easier to handle and form balls plus it prevents the cookies from spreading too much, while baking. All ingredients should be at room temperature so they blend together smoothly. Cookies can be rolled in granulated sugar or sanding sugar. I used sanding sugar. Baking soda is used in this recipe, NOT baking powder. Don’t replace one with the other! These cookies have a tendency to get hard after about 24 hours. If that happens, place a slice of bread in the cookie jar, tighten the lid and just let it sit overnight. The next morning, the bread will become hard and the cookies will become soft. That’s because all the moisture from the bread is now in the cookies. Throw out the bread and enjoy your cookies. These are the BEST molasses cookies ever! The use of butter and shortening makes these cookies soft. The chewy texture comes from the use of molasses. Don’t use dark molasses since it has a different flavor than regular unsulphured light molasses and can drastically change the flavor. Mix in 1/3 cup finely chopped crystallized ginger in the cookie dough mixture OR you can add 1.5 tbsp freshly grated ginger. Mix in 1/4 cup quick cooking oats in the cookie dough mixture. These cookies are usually enjoyed without icing but one option could be be a drizzle of royal icing or glace icing, which dries hard. Another option would be spreading classic American buttercream frosting on top of each cookie. What do molasses cookies taste like? They have a sweet and spiced flavor with a soft and chewy texture. Are molasses and gingerbread cookies the same? No, they are not the same but they are similar. 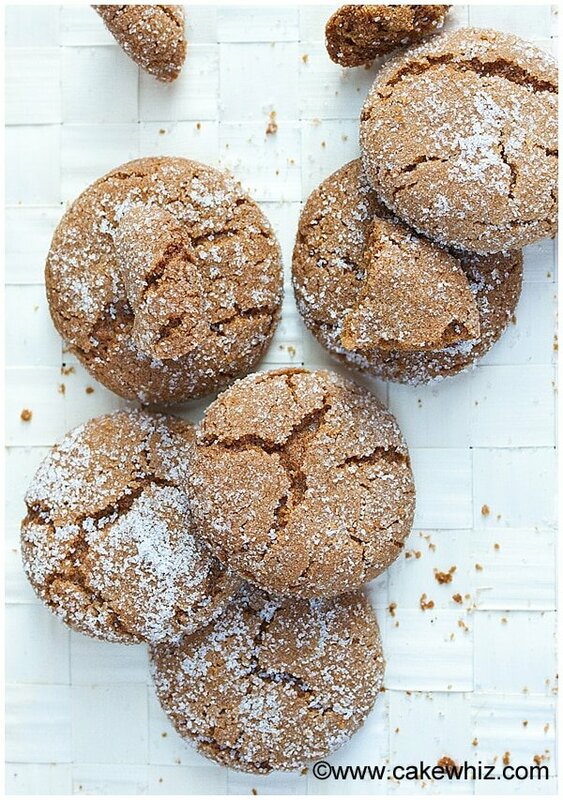 Ginger cookies usually have ginger and they have a crispy texture while these cookies are soft and chewy with no ginger. How do you make molasses cookies? Cream together butter, shortening, sugar. Mix in egg, vanilla extract. Separately, whisk together the flour, baking soda and spices. Dump dry mixture into the wet mixture and mix until combined. Make small cookie dough balls. Roll them in granulated sugar. How long do molasses cookies last? They can be stored in a cookie jar at room temperature for 3-5 days. Cream together butter, shortening and brown sugar until fluffy. Add egg, molasses, vanilla extract and mix until smooth. In a separate bowl, whisk together the flour, salt, baking soda, cinnamon, nutmeg, clove powder, allspice. Dump this dry mixture into the wet mixture and mix until just combined. Use your hands, if necessary to mix everything into a cookie dough consistency. Chill for at least an hour in the fridge so that dough is easier to handle. Scoop out small portions of the dough and make small balls. Roll them in a bowl of granulated sugar and place them on a cookie tray, lined with parchment paper. Bake at 375 degrees for 10 minutes or until edges are firm. Allow the cookies down completely in the tray before removing them and enjoy. It is 1/4 CUP of shortening? Can’t wait to make these!